Are you rocking the summer feeling yet? I know it’s only May, but I totally am. There’s a billboard I drive by once a week for one of the island’s big nightclubs that says “#FeelingTheSummer”. It gives me instant summer party vibes every time I see it! And I’ve been looking at it since the beginning of April. I guess their marketing team knows exactly what they’re doing. You know what else gets me #FeelingTheSummer? 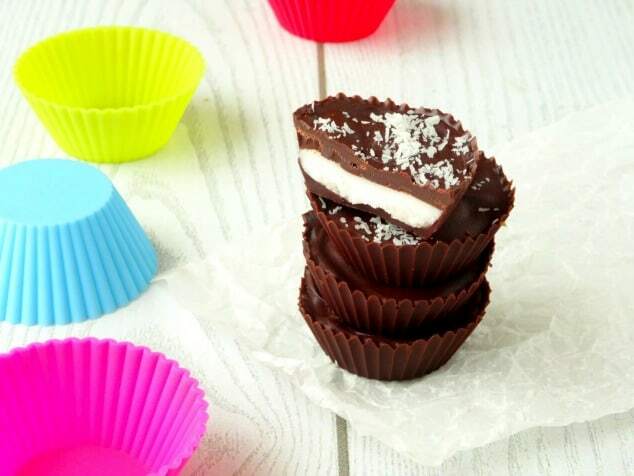 These coconut chocolate candy cups. The coconut gives me a wonderful tropical hit, almost like a piña colada on a golden sandy beach. While the chocolate always satisfies my sweet tooth craving because it’s simply not a snack if there’s no chocolate, in my opinion. Not only are these coconut chocolate candy cups healthy, but they’re also vegan (if you use vegan dark chocolate), gluten-free, paleo and refined sugar-free. Can you believe it?! I swear, take just one bite and you’ll think some magic kitchen fairies visited you in the night and turned 4 simple ingredients into gourmet heaven. 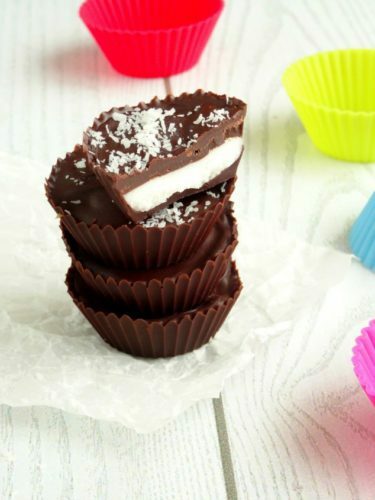 Even though these coconut chocolate candy cups are super nutritious, you don’t want to be gorging on them one after the other. To help with portion control, I made mine in these mini silicone cupcake molds. They’re the perfect size for individual servings and the bright colours are just gorgeous! Looking for more healthy summer snack recipes? Try these Raw Vegan Brownie Bites (only 60 calories each!) or these Frozen Snickers Banana Bites. Place the dark chocolate into a small bowl and melt for around 60 seconds in the microwave until totally liquid. Remove and stir every 20 seconds to make sure the chocolate doesn't burn. Spoon 1 1/2 teaspoons of melted chocolate into the bottom of 12 silicone molds and spread a little up the sides, creating a cup-like shape. Place the molds into the fridge to chill. Next, make the coconut filling. Place the shredded coconut, coconut oil and maple syrup into a high speed blender (I use my NutriBullet) and process until the coconut completely breaks down and you've got a sticky dough. Remove the mold from the fridge and place 1 tablespoon of the coconut sticky dough on top of each chilled chocolate cup. Press down to get the coconut as flat as possible. Top each cup with 1 1/2 teaspoons of melted chocolate and spread it so it totally covers the coconut. Return the cups to the fridge for a final hour to set. I imagine these are really moreish, but a delicious treat in small enough bites not to feel too guilty. A wonderful recipe idea. You’re so right, Helen. Moderation is key! 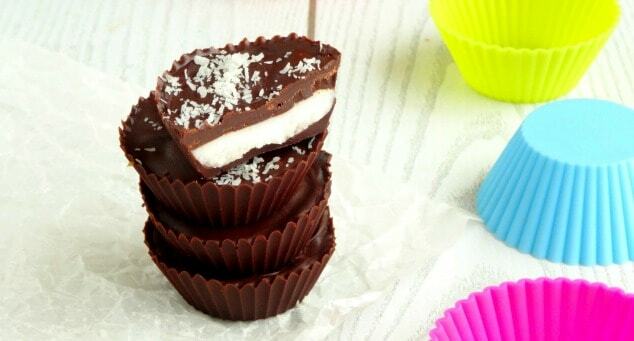 These coconut chocolate cups sounds amazing! I never thought that chocolate and coconut would work till I had this Chocolate Coconut Cake! And I’ve been wanting to sample it since…. but a whole cake is a lot of work! This, on the other hand is totally do-able! THANK YOU! Chocolate and coconut really is a wonderful flavor combo! Well you had me at coconut — but then you said chocolate too… pretty sure we’re sisters separated at birth! 😀 You can never go wrong with chocolate and coconut, right?! Love how clean these ingredients are! The perfect sweet treat! I’m so glad you agree, Lisa! These chocolate cups look absolutely delicious! I love chocolate and coconut together!